HHPR continues to be beyond capacity and we must deny new admissions until further notice. We must adopt out more cats to make room for the intakes on our waiting list. We can only offer our Outreach Foster Program. Call 999-1075 and leave your information. If you find an injured cat, please call your local Animal Control Officer or Police Department. If they refuse to assist you, call 999-1075 for advice. If you have a stray hanging around your house and are concerned about the cold temperatures, we may be able to help you with a winter shelter. The winning ticket was drawn Saturday, Dec. 21, 2013 at Monica’s in Caribou. Dot Peterson of Caribou was the lucky winner. 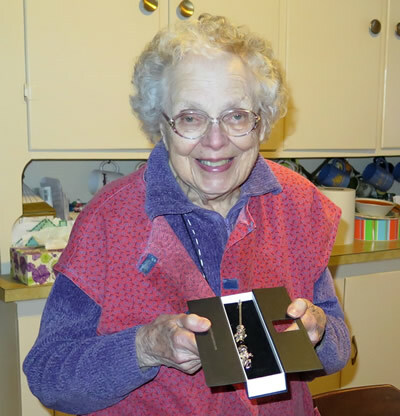 Norma Milton stopped by her home after the drawing to present Dot with her beautiful new bracelet. She was very surprised and happy. Monica’s Scandinavian Imports of Caribou has created this beautiful Trollbead bracelet with a cat theme, valued at more than $650. They have offered this to HHPR to raise money. Each bead has meaning and is beautifully crafted. November 11-17, all adult cats FREE to Veterans and their families. The big Cat-o-Rama is over. We have many adoptions but we remain at capacity and cannot accept any new admissions until we can get our population down to a manageable level. Our adoption rates return to normal: adult cats are $40 and kittens are $55. All adults have been spayed or neutered and kittens go home with the voucher. On November 6 the Caribou Big Cheese Pizza ran a Halfway Home Pet Rescue special: Purchase a medium pepperoni pizza for just $3.99 and they will donate 50 cents to HHPR. A great deal! UPDATE: BIG CHEESE PRESENTED HHPR WITH A CHECK FOR $200. We had launched a new fundraising campaign at Indiegogo, which is now closed. The over capacity crowds all year had strained our financial resources and we needed to raise funds to replenish the accounts. Because so many of the cats that we serve require medical care, our vet bills can get really big. We always need donations for our medical expenses. We’ve been so over capacity that we are having a special weeklong event. All cats over the age 6 months are FREE. They’ve had all their medical done – spay/neuter, vaccinations – more than $200 worth of care. Plus they go home with a starter kit. AND kittens are just $25 and they go home with a spay/neuter voucher! Call 999-1075 for an appointment. Complete an adoption application in advance. July Special – FREE cats, reduced price on Kittens and Extended Hours! HHPR Adoption Center at 489 Main St. will be open from 5 to 7pm Thursdays throughout July in addition to noon-3 Saturdays. All adult cats sheltered 30 days or more will be FREE. All spayed/neutered, Leukemia/AIDS tested negative, wormed, distemper and rabies vaccinations and given a 30-day parasite treatment ($150-200). Cats sheltered less than 30 days are $20 and also include said medical. Kittens over 10 weeks of age can be adopted for only $40.00 (down from $55.00) including a spay/neuter voucher for when they are old enough. They have their 1st distemper vaccination and if age appropriate-their 2nd distemper, and all other age-appropriate medical treatment. Eat, Drink and Be Merry – Because you’re helping HHPR! Please join Halfway Home Pet Rescue and Ruby Tuesday (Presque Isle) in their Community GiveBack Program. Enjoy a meal at Ruby Tuesday on JULY 26, JULY 27, JULY 28 and/or AUGUST 3 and present the flyer to your server and Ruby Tuesday will give back 20% of your non-alcoholic purchase to Halfway Home Pet Rescue. How awesome is that?!?!?! If you forget your flyer, please mention that to your server. The Northern Maine Fair will be JULY 26 thru AUGUST 3. So go and enjoy the Fair and then have a great meal at Ruby Tuesday (with 20% going to HHPR)!!! We will also have the flyer available at the shelter today during our adoption fair from 12 noon to 3:00 p.m.
Frontier Pharmacy of Caribou held their Grand Opening fun family event on Saturday, July 13 from 9 am to 1 pm. There was a bounce house and face painting for the kids, free hot dogs, free coffee and goodies, doorprizes, giveaways and drawings. PLUS – HHPR was there with KITTENS for the kids (and grownups, too) to enjoy ! And to top that off, for everyone who switched their prescriptions to Frontier, the good folks at Frontier Pharmacy will donate $20 to HHPR. Over the 4th of July weekend, HHPR will celebrate the kindness of all of our supporters, with a big, really big sale on the adoption of all cats over the age of 6 months. All of the cats are spayed/neutered, Leukemia/AIDS tested, distemper, rabies vaccinations, wormed and treated with Revolution (a 30-day parasite prevention). Almost $200.00 worth of FREE medical care with your new adopted pet. And the pet, by the way, is totally FREE of any adoption fee on Saturday, July 6, from 12 noon to 3 pm at our Adoption Center on 489 South Main St. Caribou. Come celebrate with us, and give a home to a new and loving member of your family. Adoption applications must be approved. Download your application here. $2,000 worth of tickets sold in our big Fundraiser Drawing for organic beef, pork, barbecue grill. Thanks everyone! It is kitten season again and our foster homes are busy ! We never have enough qualified foster homes so if you have ever given it any thought, please contact us and we’ll fill you in on what it’s all about. Our kittens came in pretty much all at once and it has been a bit overwhelming, but all the kittens appear to be healthy and thriving. Most of them are a tabby mix and there are a few black, black and white, orange, buff, etc. It’s quite a variety! The mommas are doing the best they can and foster mommas (feline and human) are helping wherever needed. We will post on Facebook when these babies begin to reach adoption age. Thanks to everyone for coming to see us at our yard sale. Your purchases and donations are greatly appreciated. HHPR hosted a Yard Sale at our 489 Main Street Adoption Facility: Saturday and Sunday, May 18th and 19th 8am -5pm. All proceeds go directly to the care of the animals. Because we are an all-volunteer organization, we do not have administrative overhead costs. Harry is currently in a foster home where he can find the best sunny spots in the house and gain some self-esteem. He is a very affectionate guy and when he gains weight he is going to be a very, very nice companion.Harry is a young, neutered, declawed male who was basically thrown out to fend for himself. The Fort Fairfield police rescued him and brought him to HHPR. After much evaluation and medical attention, it was determined that Harry had a bum thyroid that was preventing him from gaining any weight! We had a few options, but the only one that we felt was the best for him as surgery. We opted to have that gland surgically removed so that Harry could at last have some sort of life. He is recovering very well, every day is getting stronger. The Fundraiser is over and we raised $785 thanks to all of you. We continue to welcome donations for the medical care of these special cases. For the latest information, visit our Facebook page. You may also donate through this site here or mail a check to HHPR, P.O. Box 488, Caribou ME 04736. Special Note: Our beloved Harry eventually succumbed to organ damage. His last months were spent in a loving foster home and that was the best we could do for him. Wow, have we been busy! We moved our Adoption Program into our 489 Main Street location back in October 2012, we expanded our team of amazing volunteers, we improved procedures, gained more national recognition, rescued some unforgettable cats and kittens, and met some wonderful adoptive families. We started our Itty Bitty Orphan Kitty Program education series in April. Our goal is to educate the public about these little ones but we also hope that some of our attendees will consider becoming foster providers. We had a wonderful visit from Katie Hansberry, Maine State Director of the Humane Society of the United States (HSUS) and Suzanne D’Alonzo, Shelter Services Coordinator of the HSUS. During the visit we exchanged some great ideas and best of all, we were told that HHPR is right on target with meeting the standards of care outlined by the Association of Shelter Veterinarians! In April we did intake number 1,000 – a cat in desperate need of care who we named Harry. This terribly ill cat was brought to HHPR by the Fort Fairfield Police. He was nothing but skin and bone but obviously wanted to live and be loved. He received immediate care but it was soon learned that he had a thyroid condition requiring surgery. As of this post, Harry is recovering well from his surgery and his spirits are great. Then, to top it all off – our mascot Toby won the Judges’ Choice Award for Best Personality in the World Spay Day 2013 Pet Pageant, coordinated by the Humane Society of the United States. Read the whole story written by Natalie Bazinet of The Aroostook Republican. So, it is fitting that the new website be launched at this time to celebrate all the wonderful good fortune that has come our way. And we could not have done it without the support of our many, many followers and donors. 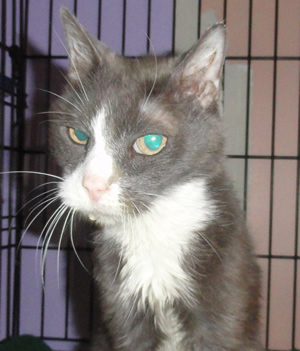 Chester is a young adult male cat who was seen hobbling around with a wounded leg. A concerned citizen reported the situation and HHPR stepped in to get Chester medical attention. After medical evalutation and consultation, we decided to proceed with leg amputation. He has received the usual excellent care by the Presque Isle Animal Hospital and is now recuperating in a HHPR foster home. Halfway Home received grant of $3956 from the Belvedere Animal Welfare Fund through the Maine Community Foundation to build up the Foster Outreach Program that we have successfully piloted. The Outreach Program provides a temporary solution to the limited shelter space in the area. 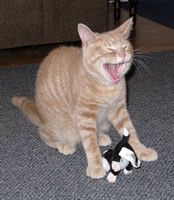 Congratulations to Takara and Mandy McNeal, winners of the first HHPR cat photo contest! We’re honored that so many of you chose to share your cat’s pictures with the Halfway Home community — we think that they’re all winners! Presque Isle Trash and Treasure sale April 14 & 15 was good to HHPR. Thanks to the volunteers and the shoppers we raised a nice amount to help out with the medical expenses. We are into kitten season and have had a few special cats come in that needed extra care. We also greatly appreciate all the kind words of support from many of you who stopped by our booth. Many of you on Facebook have followed the sad story of Tabitha (formerly Smokey) who has been recovering at HHPR from burns and smoke inhalation she suffered from a house fire in March. Her owner perished in the fire and this beautiful girl was found hiding under some furniture. After being given emergency treatment she was brought to HHPR and treated at the PI Animal Hospital. She’s had a rough time but has healed from her injuries and has been doing well at HHPR. Her original family is not able to provide a home for her so she is available for adoption. Tabitha is a sweet girl. She will do best in a one pet home. Read more about Tabitha in People Magazine Online. Note: Tabitha has been adopted. We have had many cats and kittens come through our doors this season. We want to give a special Thanks to our outreach support at Tractor Supply Company, 23 Houlton Road, Presque Isle. They have generously allowed us to display some of our adoptable cats and kittens which has increased our adoptions and made the holidays happier for all. We are launching a 2nd Annual $1.00 for $1,000 donation state-wide, world-wide competition for 2012. Last year we raised $3,000 for the future building and we hope to beat that this year. So please get your $1.00 dollar bills ready and your envelopes addressed and stamped. Hopefully enough people will send their $1.00 donation to beat last year’s total. The City of Caribou wants HHPR to relocate from our residential site to a commercial area by Dec. 31, or they threaten closure of the current location. Where will these poor cats go as of January 1, 2012 and what will happen to all the frozen, frostbitten cats in January, February and March? We had a small crowd out to the Dance for the Animals – but a good time was had by all. Thanks for coming to support us! We want to thank our volunteers for their hard work to put this together, the Crow’s Nest for the venue and Steve Boddy of DJ KC & Company for providing a great music mix. Below and are some snaps from the event. Lily with her new legs. Many of you have been moved by our special rescue story of Lily, also known as “Paddles” and we thought you’d like to see a recent photo of her when she and her mom Judy visited HHPR. Lily was born with crooked legs but she was young and healthy, so Dr. Andrea Pesut thought trying some splints would work. And she was right. You can see how beautiful she is and how straight and normal her legs are now. Lily is one of our “poster” kitties because she represents our mission so perfectly. Halfway Home Pet Rescue is the 2011 recipient of the Spirit of Caribou Award. This award is presented by the Caribou Chamber of Commerce & Industry for the organization that improves quality of life through its volunteer program. We are very pleased to receive this recognition on behalf of all the dedicated volunteers who make it happen every day. HHPR will be presented the award on April 1st at the Annual Recognition Dinner held at the Caribou Inn & Convention Center. The Board of Directors of Halfway Home Pet Rescue recently voted to initiate an Emergency Outreach Program in response to many county shelters being filled to capacity. The emergency package plan aims to allow people who care enough to call the shelter for help with a stray cat to receive a temporary loan of a cage, litter box, scoop and a 3-day supply of litter, dry and canned food while being put on a waiting list for an available cat unit. As soon as HHPR has space available or knows of a county shelter having space, the cat will then be entered into a shelter system. This plan gives the temporary foster family of the stray cat help while allowing the shelter time to plan ahead for needed units. HHPR will assume the responsibility for having the cat vet checked for Leukemia/AIDS, spayed, shots while the cat is fostered so that it is ready for adoption on entry. HHPR has been approved by Best Friends Animal Society to participate in the Network Charities Program. This affiliation will allow us to increase our exposure and participate in the many benefits of the program. We are very excited about this affiliation! This unique handmade quilt was created by Nancy Bosse of Caribou with materials donated by Sheri Vogel, also of Caribou. Nancy has donated this work of art to help our Building Fund. The drawing was held during our June 4th adoption fair and it was won by Patsy Malm. April 2011: Members of the AFGE Local 294 union recently donated a memorial gift of $500 to Halfway Home Pet Rescue (HHPR) in honor of their co-member Barbara Thompson who died unexpectantly on April 18, 2011. 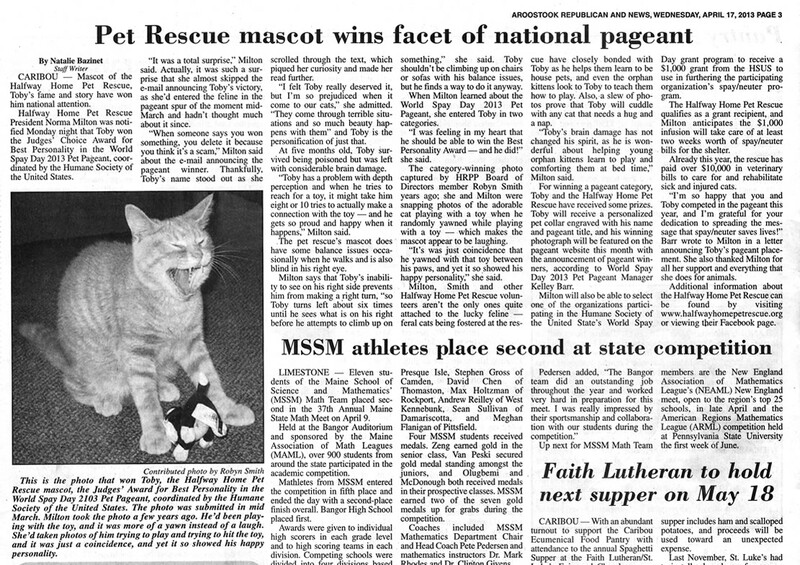 Ms. Thompson was a dedicated animal welfare advocate. AFGE President, Mark Durinski gave the gift in her memory. Pictured below are (from left) Warren Houlette, HHPR volunteer, Norma Milton, HHPR president, Anne Price, HHPR secretary, Kathy Tamburello, AFGE union member, and her son Jasper Tamburello. The memorial funds will be used for the spay/neuter voucher program. Our “Be My Cuddly Valentine” Kitten/Cat Adoption Fair was held at the Tractor Supply Store in Presque Isle February 12th and 13th. We met a lot of nice people there. Cats were adopted, money was raised for the animals, door prizes given out, balloon animals made, and more. Thank you all for coming to see us! October: Arts & Crafts Fair, Caribou was a great success. We raised just over $1,000 from sales and donations. Sept 10-11: Judy Robertson hosted a garage sale at her home. August 12: CARIBOU CARES ABOUT KIDS Chicken BBQ sponsored by the Sports Inn was a great success! Thanks to all who came to support us! Employees of Thompson Hamel LLC, and Robert Thompson E.A., of Presque Isle, chose to support Halfway Home Pet Rescue during the holiday season. Employees donated needed pet supplies to the shelter as well as contributing over $400 to be used toward the shelter’s vet bills and our new building fund. In addition, Brandon Thompson, son of ‘Jay’ Thompson, grandson of Arthur and Marilyn Thompson, donated $50 of his Christmas money to help the animals. We have a lot of nice items for sale at extremely reasonable prices. All proceeds go to help the animals. Donations are also welcomed. We are at 246 Sweden Street, Caribou. December 4: 11 cats/kittens adopted. 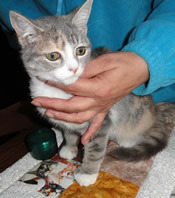 November 13: 3 cats were adopted and interested expressed on others. November 6: 14 cats and/kittens were adopted! October 2010: A wonderful turnout. We found homes for 11 cats/kittens. 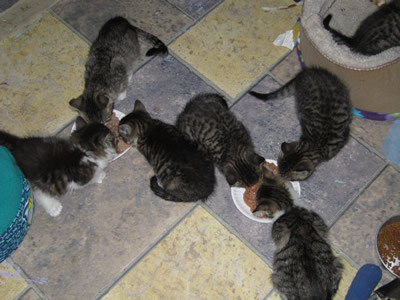 August 2010: Through our August Adoption Fair, we placed 9 adult cats and one kitten. Thank you!! February 2010 – The winner of the Beautiful Cat Quilt made by Carolyn Hayden of Caribou was Wendy Koenig. Three lovely cats went to good homes: Bonnie, Babe and Angie. Also, Tiny Tim, Rocky, Big Daddy and Alex are being thought about and I feel these homes will come through. What a wild and wonderful afternoon. January 2010 – Adoption Fair was held on January 23rd in the back area of the Expect More Dollar Store in Caribou. Available for cuddling were Tiny Tim, Big Daddy, and 3 of his offspring. HHPR is very grateful for the donation of money, knitted goods and supplies from the Caribou Catholic Golden Ages Group at Lyndon Heights. Paul Allen of WEGP Radio, The Talk of the County, interviewed Norma Milton about HHPR programs and mission. Dec. 2009, Presque Isle, ME – During the month of December, employees of Thompson-Hamel, LLC and Robert Thompson’s accounting firm set up a box in their offices to collect cash and pet supply donations for Halfway Home Pet Rescue and on December 18th Brian Hamel, Managing Partner of Thompson-Hamel, LLC, and Sharon Watson, an Associate at Thompson-Hamel, represented the two firms at Halfway Home Pet Rescue’s headquarters in Caribou and presented its President, Norma Milton, with these very generous donations.